Unless you have a fake copy of Windows, you’ve lost your original product key, or your Internet connection’s slower than a filibustered Senate, you should buy the Windows 8.1 Online Upgrade. (The name may vary depending on where you live.) You can find it in your local computer store or online at, among other places, the Microsoft Store and just about anywhere software is sold. If you run the online upgrade, as a bonus, you also get a no-hassle run of the compatibility checker, which can be a real godsend. 1Make sure you have a backup of everything that’s important to you. The only way to undo any upgrade to Windows 8.1 is to wipe it out and start all over again. 2Start Internet Explorer, go to the website specified in your upgrade package, and follow the instructions to connect. The website’s probably www.windows.microsoft.com/en-US/windows-8/download, or some variation, but the location may change. Do whatever your instructions say. 3If you don’t want spam leave the sign-up box empty and select the Download Windows 8.1 check box. If you see a notification that asks about running or saving the Upgrade Assistant program, click Run. No, you won’t download all of Windows 8.1, in spite of what the button says. 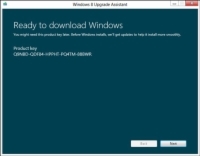 The Upgrade Assistant is a small (5MB) file that guides you through the installation. 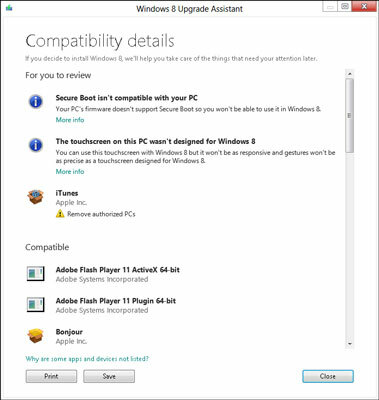 The Upgrade Assistant runs a compatibility check and shows you a summary of the results. 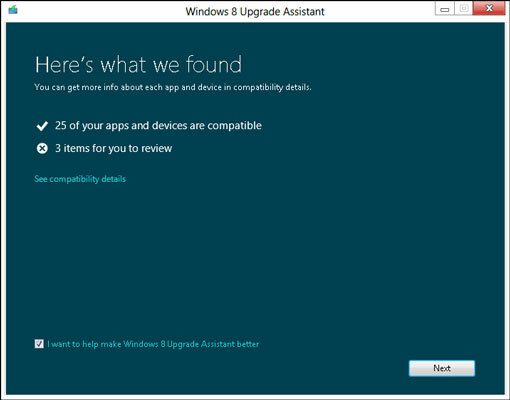 4If the Upgrade Assistant report shows any items for you to review, click the See Compatibility Details link. 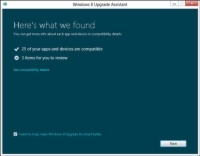 The Upgrade Assistant shows you a report, which displays common compatibility problems for anyone upgrading from Windows 7. Make sure you understand the implications of the report. If there are any significant problems, it’s much, much better to solve them now, rather than waiting until after you’ve upgraded to Windows 8.1. 5Take your time and when you’re sure you can solve all the problems in the report, print it if you like, and then click Close. You return to the compatibility report. The installer may show you a product key. 7If you see a product key, take a picture of it with your phone. Or you can pull out a stylus and handy clay tablet, or try indelible ink on the palm of your hand. You probably won’t need the key, but if you do, you’ll be glad you have a copy. The installer starts downloading a big file. On a typical ADSL connection, this may take 30 minutes; on a Google fiber line, oh, about ten seconds. When the download’s done, the Upgrade Assistant screen appears. To install now, keep the Install Now button selected (it’s selected by default). To create a DVD or USB drive that can be used to install Windows 8.1 on this computer, choose Install by Creating Media. 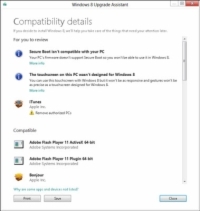 To put an installation program on your desktop to use later, choose the last item, Install Later on this Computer. Most likely, you chose Install Now in Step 9. If you did, Windows whirs for a while and then comes up with a Choose What to Keep dialog box. The choices (Windows Settings, Personal Files and Apps; Just Personal Files; Nothing) vary depending on which version of Windows you’re upgrading from. 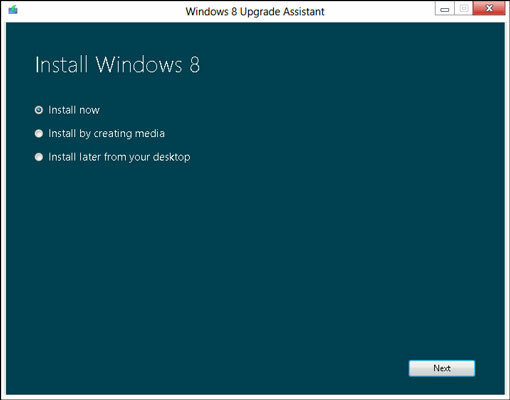 If you chose Install by Creating Media, the installer downloads the files necessary for installing Windows 8.1, helps you put them on a DVD or USB drive, and gives you a product key that will work on this particular PC. 11Choose what you want to keep and then click Next. The upgrader makes a special compatibility pass to make sure you’ve been notified of all the possible problems. It may even ask you to uninstall programs (such as antivirus or firewalls) that may interfere with the upgrade. When everything’s okay, you’re prompted to restart your machine. Your old version of Windows shuts down and then comes up. You’re asked whether you’re ready to install Windows 8.1. 13Make sure Continue from Where I Left Off is selected and then click Next. The User Account Control challenge appears. You may have to provide the user name and password for an admin account on your Windows 7 computer. The installer, again, checks to make sure everything is okay. When it’s done, the Ready to Download Windows screen. 15Jot down the product key (you probably won’t need it) and click or tap Next. Go have a latte . . . or two . . . or three. This installation can take 30 minutes or more. Don’t touch your machine while Windows works. You’re ready to personalize your installation.